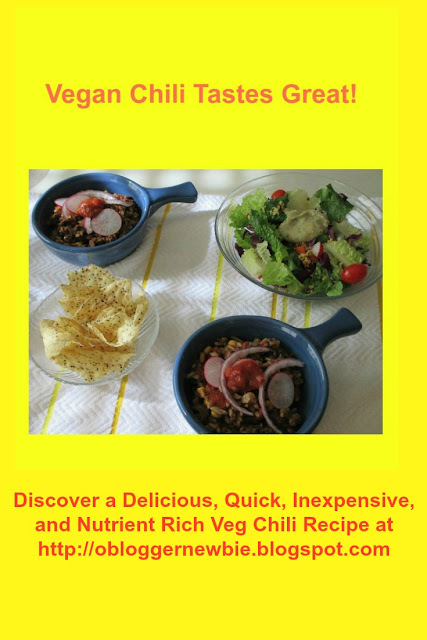 The multilayered flavor of this vegetarian chili comes from basic pantry ingredients including vegetables and spices. This dish is simple and inexpensive to make, gluten free, vegan, and loaded with plant-based taste, protein, and fiber. Feel free to leave out or add additional vegetables or seasonings, and know any beans you like fit in well. The recipe is adaptable and forgiving so relax and have fun in the kitchen. The way this dish is set up now, it yields 4 large or 6 moderate servings. It contains approximately 10 g of protein in every portion, and makes great leftovers too. 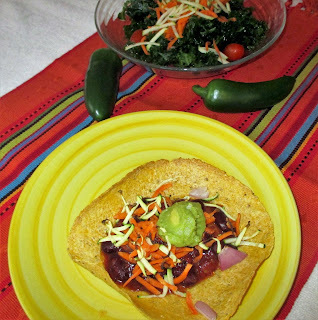 · Garnishes can include: sliced avocado, guacamole, corn chips, scallions, radish, red onion, gluten free vegan cheese, nutritional yeast. 1. In a large Dutch oven or other heavy-bottomed pot, put in chopped red onion and sauté dry over medium heat until soft (about 2 minutes). Add chopped garlic, red bell pepper, carrots, mushrooms, and stir. Continue to sauté without oil by adding a drop of water to fry pan. See more by clicking this link and going to step 2 (directions for browning onion and garlic without oil). 2. Add chili powder, cumin, and a half to a whole (depending on how hot you like it) jalapeño pepper finely chopped. Stir until fragrant, which should take approximately 1 minute. 3. Add three cans of beans, water, and bay leaf. 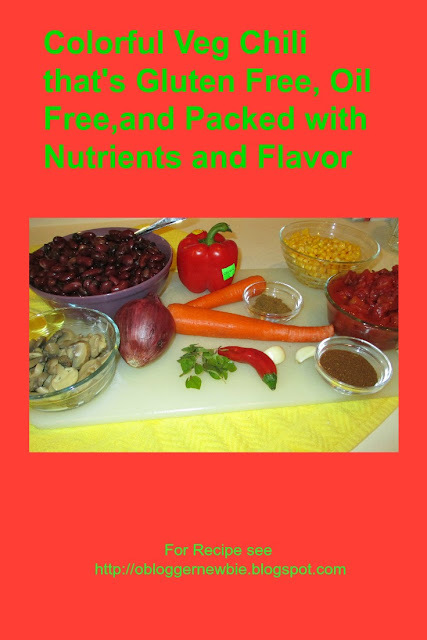 If you'd prefer to use cooked dried beans, see how to prepare dried beans. 4. Stir in canned or cooked dried beans to combine and let the mixture come to a simmer (covered). Add the diced tomatoes and juice. Cover and continue cooking, stirring occasionally. Reduce heat as necessary to maintain a gentle simmer. Cook for 25 minutes. Add corn kernels and lemon or lime juice and cook 5 minutes more. Correct seasoning by adding salt and fresh ground pepper to taste. Remove chili from the heat. Serving Suggestion: This dish is hearty, filling, and tastes great. 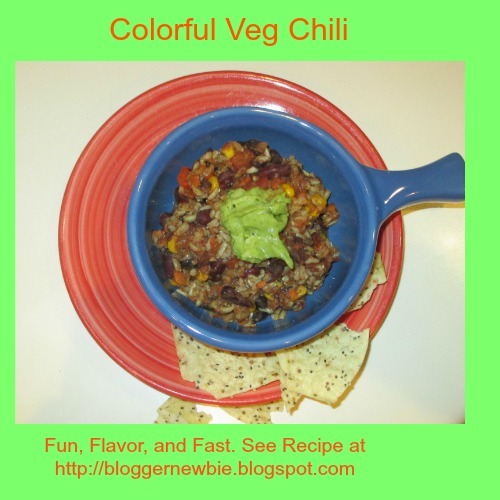 Place chili in colorful dishes and serve with sides of guacamole, salsa, and steamed brown rice. If you want to keep it real simple, mix cooked brown rice, salsa, and guacamole into chili for a flavorful meal! Why not try this recipe too? Colorful-Tasty-Tucson-Tacos. Please Note: I write and publish topics of interest for those who want to create and maintain a healthier lifestyle. My Website is www.nancyandreswriter.com. To see information about my writing services, details about the interactive self-care journal, Colors of Joy: A Woman's Guide for Self-Discovery, Balance, and Bliss, and health tips and ideas visit often. Margaret Cousins, novelist. "Chili is not so much food as a state of mind. Addictions to it are formed early in life and the victims never recover. On blue days in October, I get this passionate yearning for a bowl of chili, and I nearly lose my mind." Do you eat beans often? What are your favorites? 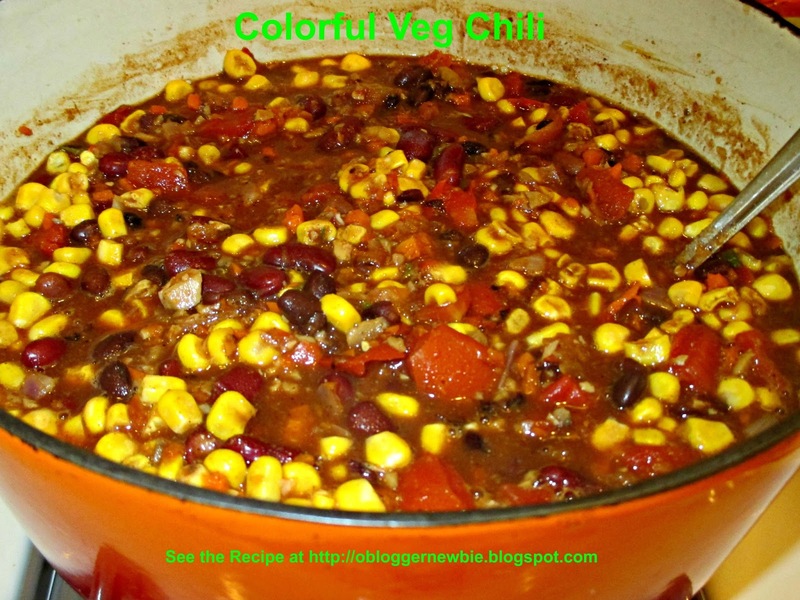 Do you have a go-to chili recipe you'd like to share? Please let me know by commenting in the space provided below. This post has been shared at NO RULES WEEKEND BLOG PARTY #217!